Between work, house renovations and some other small projects work on the robot has stalled over the last 6 months. However as we come into summer I have started working on the robot again. The first stage is to get the big wheel driving in some fashion. So to that end I have purchased the first lot of new & raw components. 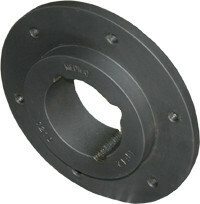 The taper lock system is very cost effective and incredibly flexible. The system of hubs and bushes will allow me to easily install and remove hardware from the main shaft. As the system is developed I can also make adjustments to the shaft size, replacing the bushes with larger sizes without having to re-machine and change the hubs. Weld on hubs will be installed in the main wheel rim. Where the test frame arms were cut off the face will be cleaned up, machined flat, and bored out to suit the hubs assuming the pipe is central to the rim. If it isn’t then we improvise. 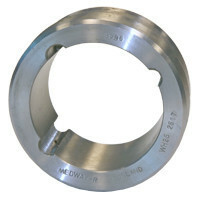 This will most likely result in facing the entire hub back flush with the main rectangular tube, removing the previous pipe and making additional flanges to support the taperlock hub. This should be a fairly basic turning operation. Bring the raw stock to a final uniform dimension across the length of the shaft. Face the ends, drilling & tapping for potential future applications (why not if its in the lathe already). Then machine a series of keyways to interface with the taper locks. The original calculations were based on a 30mm O.D. with a 20mm I.D. For a marginal price difference and to simplify machining I purchased solid stock and will not be boring out the ID. There is a moderate increase to inertia which will be insignificant for the entire system (big heavy wheel) & a healthy decrease in deflection.